Nestled away in the hillside area of Chaweng Noi, Villa Jaliza is surrounded by a vast expanse of emerald coconut groves and jungle forestry. 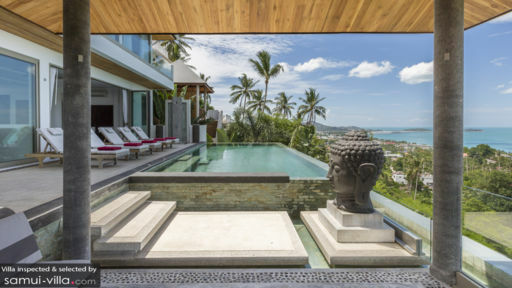 Perched upon an elevated position, the villa overlooks the scenic coastline and turquoise seas of Chaweng. Five finely-appointed bedrooms are furnished with cushiony beds, plump couches and emerald stone bathroom walls. All bedrooms feature luxurious en suites, a balcony and panoramic views of the sea. All rooms are equipped with plush king sized beds, with the exception of one guest bedroom offering twin beds. The sixth bedroom furnished with a double bed and bunk bed, but no sea view. A sparkling infinity pool welcomes vacation makers to jump right in for a refreshing dip. After an invigorating swim, dry yourself on a beach towel before lying upon the pillowy sun loungers, or seek respite from the tropical rays by taking shade under the airy sala. The spacious pool deck offers plenty of space for guests to indulge in a round of sundowners or alfresco meal under the stars. Turn on the mood lights to cast a soft glow over the outdoor area, and set the atmosphere for a romantic and intimate night. 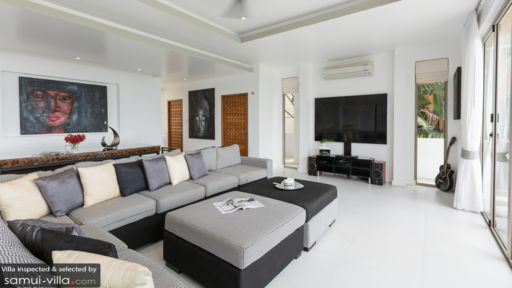 Sleek and chic, the commodious living spaces boast pristine white walls and flooring, as well as a tasteful selection of contemporary furnishings in monochromatic hues. The vaulted teak ceilings create a sense of spaciousness within, while the intricate wood furnishings and oriental ornaments add an Asian accent to the rooms. A well-equipped kitchen, bedecked with modern touches such as polished marble counter tops and luxe culinary amenities sits next to the dining area. Expansive sliding doors flank the walls of this common area, drawing the eyes to gaze out at the striking coastal landscape beyond. Your stay at Villa Jaliza includes housekeeping services, personal guest services, security services, welcome drinks and airport transfers. A baby cot is available for use free of charge. Amenities available at additional cost include a daily breakfast service, personal chef services, security services, laundry service, in-villa massages, bicycle rental, vehicle rental, boat rental, personal driver services and professional child minding services. A three kilometres walk will bring vacation makers to the nearest beach. Golfing enthusiasts will be delighted to indulge in a golfing session at a lovely nine-hole course built on the mountainside of Lamai and Chaweng. Guests with a need to stock up on groceries can take a quick seven minutes’ drive to arrive at the nearby Tesco, Big C and Markro supermarkets. Neil, O, Kob, Nam and team - thank you for making us feel so at home in Thailand. The house was amazing, so much space, all rooms are great with breathtaking views (seeing that full moon rising was just out of this world), the large rooms, best in class beds and bedding, art decor throughput the house, the wood-concrete construction, the luxurious baths, spotless cleanliness, comfi living room, fun pool table, huge high tech pool, and so so much more. And the team - from the warm early check-in, to booking our full moon tickets, to daily laundry and meals - perfect. Neil and O's responsiveness is phenomenal and always so service oriented. We are writing this before leaving this tomorrow so we do not Miss the chance to thank you before we are back to the real world craziness, everyone should get a chance to visit Jaliza! You made a group of 10 guys very happy! Our Group of 8 arrived at the Villa and were blown away by the amazing sea views. The Villa Manageress had welcome drinks and a large bowl of fruit waiting for us. We love to cook and the Villa has an amazing Kitchen. We had the Chef service for 2 nights and all I can say is Fab!! amazing!!. The Villa is located close to the beaches and close to the local attractions and the Chaweng night life. I would recommend any family or group to stay at Jaliza. We will be back in the Summer for sure. My family and I (that's 9 adults) had the most wonderful stay at the most amazing villa you could ever wish to stay at over Christmas and New year. On arrival the manageress greets you and shows you how everything works and gives you a mobile phone with all the numbers In the contacts list that you may need, this was a great help. The villa was spotless and the fridge was stocked up enough until you went shopping the next day which was nice. The location of the villa is fantastic because of the wonderful view you get of the palm trees and ocean. The villa itself was fantastic for just relaxing in and taking in the stunning views. There was plenty to do just a short taxi ride away, things like go-Karting, elephant tracking, quad biking to mention but a few. Chaweng beach was fantastic with the soft sand and if you get chance have your lunch at the art bar which sits right on the beach. I would also recommend that you should go to the fishermen's wharf, the restaurants there are fantastic and the pace of the place is so laid back and chilled, the beach is wonderful and it too has all the jet skies and toys you would expect to see on a beach just like Chaweng beach has. 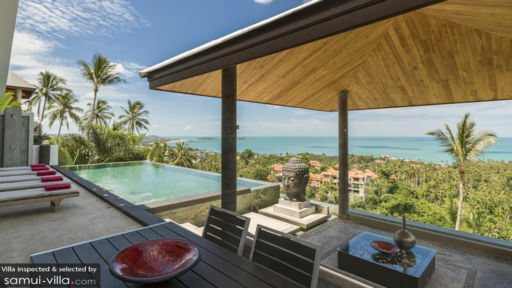 All in all Koh Samui is a fantastic place to holiday with the family and what made our holiday so perfect was the fantastic villa and those wonderful views. Thanks Neil.